off and on since the mid 1970's. We just didn't start making wheels to fill in shop time. We know what will fit and work on your ride. These wheels are not prepared for chrome as delivered. They are in a raw state and need to be prepared before painting. Powder coating is not recommended. Call before deciding on applying this process. Bearing bores are normally .001" - .003" diameter oversize for a slip fit and to accommodate bearing after finishing to eliminate installation problems. Use a Loctite Bearing Retainer Compound, Such as LocTite 635, for proper fit and bond. It is recommended that the customer sand the bores before installing any bearings and internal preload. Should you over sand or grind the bores, you can use a spring center punch to "rough up" the bore before installing the bearings. The bearing retainer will fill bores that are up to .007" oversize. Read the LocTite instructions before installation and observe the proper "set" time for the LocTite 635. We also measure and fabricate the preload for these wheels. We do not stock an inventory of preloads and hope they work. Each preload is machined to "match" the wheel you order. The spacer included with your RAW wheel is marked with a number that corresponds to the wheel number. The wheel number can be found on the flange or near the valve hole inside the tire rim. Make sure you install the correct internal spacer with the correct wheel number when you order more than one wheel. Installing the wrong internal preload is a big no-no. Serious damage to your wheel or motorcycle and serious bodily injury may result. When you order your wheel we will normally ask whether or not you know the size of the valve stem hole. If you do not, we will drill a pilot hole 5/16” in diameter in the center of the drop center of the rim. We will do this because we do not know if you will be installing a tubeless or tube type tire and the valve stem will vary in size. Should we pre-drill the hole for a tubeless valve stem, this pre-drilled hole will be to large for a tube type tire inner tube. The stainless stem valve stem we provide is for a tubeless tire and the hole you will need to drill is 7/16” diameter. The 5/16” diameter hole may cover a wide range of inner tube tires. However, if we drill the rim for a tubeless tire and you change your mind, don't dispair. The sealing ring on the included valve stem slips off and will install on your inner tube valve stem to make your installation secure to the rim. We control the bearing and preload installation. No need to worry about making the correct preload or whether or not the bearings were installed properly. No "end play" settings are required. Basically the same as RAW wheels, except we will make sure that you have made the decision before chroming on which tire you will mount “before” chroming. Drilling a hole “after” chroming will be your responsibility. Any peeling or chipping of the Valve Stem Hole will not be covered under the warranty. Should you change your mind, don't dispair. the sealing ring on the included valve stem slips off and will install on your inner tube valve stem to make your installation secure to the rim. If your dealer scrathes the area around the valve stem hole during tire mounting, and says it came that way, be advised, we photo all wheels before shipping. Yes Folks, it's been claimed before. And when we sent the photo(s), someone was embarassed. The customer is responsible for all wheel external spacing. NO EXCEPTIONS. Invaderwheels, LLC have added the Power Wedge to its line of non-OEM wheels. This feature is REQUIRED on all rear wheels in 5 spoke configuration for all rims wider than 5.0" wheels AND wheels that are being installed on rigid frame bikes. The Power Wedge(tm) adds superior strength to all RIGID FRAME and high torque motor bikes. Should you desire your wheels without the Power Wedge’s for show purposes, you must sign a waiver. We will ex[lain this to you when you call. There is NO CHARGE for the Power wedges. NO EXCEPTIONS. Installation of tires on Invader Wheels using automated, pneumatic, or hydraulic tire changers may cause wheel damage to the spokes at the hub weld junction in the radial and/or axial direction. This can happen on all motorcycle wheels. Use caution when applying pressure when breaking a tire bead or installing a tire. Make sure the wheel rim and hub are both supported before applying pressure to the tire and rim before removal or installation. Broken, scratched, dinged, abused, bent, or cracked wheels due to excess pressure, twisting, or any other physical force during these installation processes shall void the warranty. Have questions or need additional technical information? Just give us a call. You might have noticed that there are no Part Numbers on our wheels. Why is that? Well, simple. Our wheel is a custom order wheel to your particular reuirements. We make approximately 40,000 combinatins of wheels. Keeping trrack of all those part numbers can be quite a chore. Each wheel has a SERIAL NUMBER registered to the original purchaser of the wheel. When you call for a wheel we don't have a bunch of sales clerks answering the phone looking in a catalog filled with other parts like gas tanks, t-shirts, gloves, license plate holdrs and hand grips. 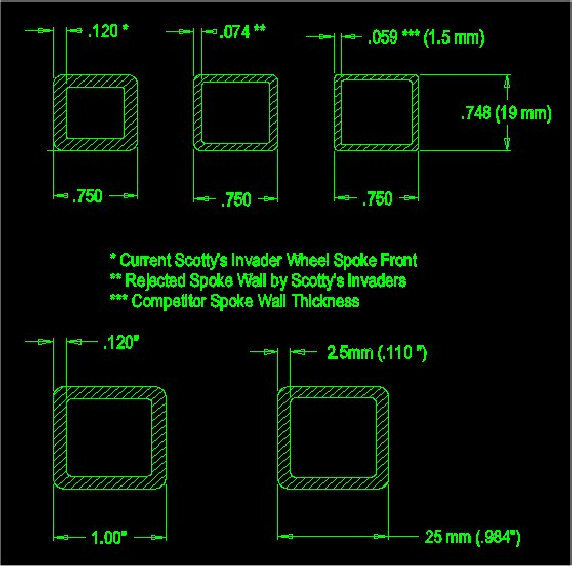 WE make only one item ... INVADER WHEELS ... and have been doing that off and on since 1974. So ... when you call we don't just ask you for a part number or look in a computer to see if it is in stock, then take your name, credi card number hang up and ship a wheel and hope that it fits. What type of front forks or rear frame are you are installing the wheel on? Is it a springer or hardtail? What is the axle size 3/4", 1", 25mm, 5/8, or something else? We also make custom size bearing bores? We don't make Universal wheels. We know what fits certain models and can customize for each year. Except the Spool wheel which can be made with either 3/4" or 5/8" bearings. And can be made with any size bearing you choose, and in in from 5 to 8 spokes. What Size engine do you have in your bike? We ask this becaue if you have a large engine we will suggest you install the "Power Wedges" on your rear wheel for added strength. Other wheel Manufacturers do not tell you about the hazards of excessive torque on standard wheels put into these situations. WE DO. We are looking out for your safety and are not just selling wheels "Off The Shelf". If we decide that a situation arises where selling you a wheel would become unsafe, we will not sell you a wheel. Period. Are you going to run a tubeless or tube type tire? Makes a difference in the size of the valve stem hole we drill in the rim. With "Universal Wheels" you get one size fits all. You have no choice. This is only an issue with RAW wheels as Chrome wheels come with a valve stem already installed. Unless you instruct us that you are installing a tube before we assemble your wheel. Beware wheels that say bearings that switch from 3/4" to 1" or 25mm. Yes they can be changed. But do you already have the bearing puller to change the bearings and the proper press to put the new bearings into the wheels properly? Are these "kits" extra? Maybe your local mechanic has the tools to change the bearings correctly. Maybe not. If you have a 1999 and earlier bike, do you have to buy a new rotor when your 1999 rotor is still perfectly good to fit that new Invader UNIVRSAL 2000 wheel? We make each wheel to fit what you have already have to save you money and use your existing parts as much as possible. How many spokes do you want in your wheel? Simple. We can make your wheel from 3 Spokes to 8 Spokes on the front in Square and Round. No Problem. Five to 6 on the smaller hub inthe rear. More than 6 will require the larger CAN hub popular in the 1970's. Custom is what we do. What size tire are you planning on installing on your wheel? Are you sure it will fit? We run into a few customers that have already ordered a tire that won't fit the wheel they think will fit on their front forks.. HERE is some data on our spoke material and our competitor spoke material. The spoke section on the left is the material we use for our FRONT wheels. It is 3/4" Square Tube and has a .120" (3mm) wall thickness. The one on the right is one that we rejected back in the 1970's for failure. It has a .078" (2mm) wall thickness. Some of our competitors are using a 1.5mm (.059) wall thickness. wall thickness - or- what works and what doesn't. personnel that have your safety and riding pleasure at heart. All our wheels are made right here in the USA. We will beat any manufacturers advertised price for Invader Style Steel Wheels by 5%.